Nolina recurvata syn. Beaucarnea recurvata is often called the Pony Tail Palm (although its not really a palm at all) With about 20 species of beaucarnea available the main features are the swollen trunk, thick trunk and the crown of foliage that hangs down. (like a ponytail). Pictured right is a mature multi trunked specimen in full flower. The Pony Tail Palm is versatile and will grow well in cooler climates, easily coping with the winters as far south as Melbourne. 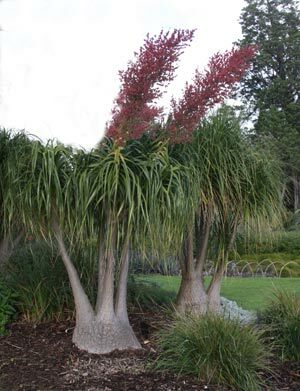 Beaucarnea recurvata or ‘Pony Tail Palm’ is the best known of the species available for sale and is widely used as a landscaping plant and indoor plant in Australia. Beaucarnea guatemalensis is the ‘Red pony tail Palm’ they are are also used in bonsai. These wonderful trees will reach a height of 7 – 9 m over time, generally in cultivation a height of 3m is more normal. However when grown in a container size is easily constrained. Beaucarnea require a warm frost free climate, good drainage is essential for beaucarnea. A major problem is excessive water, the tree itself stores water in the lower swollen part of the trunk. These plants are excellent as indoor plants, slow growing and they seem to cope well with low light. Pruning can take place to tidy up the plant, or to rejuvenate it by cutting the top out completely.